Now I have more leisure time on my hands I have been trying to hunt down some new recipes to try. It’s all to easy to get yourself stuck in a rut, eating the same meals each week purely because those are known to be good. I should also mention that I don’t eat meat, I wouldn’t really call myself a true vegetarian as I do eat shellfish and fish. My husband on the other hand does eat meat, so I try and balance that where I can. 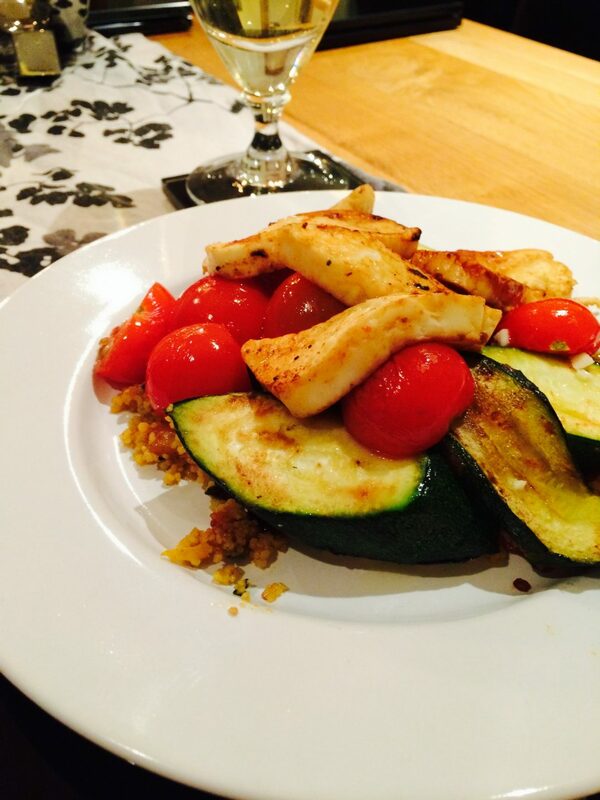 So this evening we tried a new recipe called Halloumi Couscous Salad, I modified the recipe slightly as I did not make my own couscous. I bought some lovely ready made Moroccan style couscous from Tesco which was awesome, my husband rated this highly and he really enjoyed the cranberries and raisins they add. Everything else was followed as described here at the BBC Good food website. You pretty much just add small tomatoes, I found on the vine to be the best flavour and also courgettes to bulk the recipe out. We also ditched the mint in the dressing, so I can’t say whether that is nice or not but I’m not a huge fan of mint myself. What we are both great fans of however is Halloumi cheese and I’ll be sure to show you my Halloumi stacks which I do as an alternative to burgers shortly. This recipe is one that we are going to put on our list of favourites, why don’t you try it out and let me know what you think below?